Several lakh residents of the city’s Halishahar area have been experiencing untold sufferings due to higher amount of dust in the air over the last one and a-half years. Halishahar, which comprises vast areas including Agrabad Access Road, Port Connecting Road, Halishahar Housing Estate, Shantibag, Chhotopole, Boropole and Naya Bazar areas, now wears a look like abandoned locality. The situation worsened as the authority concerned dug the Agrabad Access Road and Port Connecting Road, the two main roads use to go to the city centre and Chattogram port areas, together as part of the road development, widening and modernisation project. Chattogram City Corporation (CCC) has been implementing the works under a project funded by Japan International Cooperation Agency (JICA). But, slow pace of the works left the areas almost unlivable due to the highly contaminated air and sufferings during travelling by vehicles. Apart from the commuters and residents, the businesses of the areas are bearing the burn much while many people shifted residences after failing to withstand the situation, said sources. Dust being produced from the digging and other activities is visible in the air throughout the Agrabad Access Road that connects the Boropole with Badamtali of Agrabad Commercial area and the Port Connecting Road that connects the Nimtala Biswa Road with the Olankar Intersection. The roadside trees and establishments of the areas are covered with thick layers of dust which is a common scenario there now. Indifference of the implementing authority, carrying out works without sufficient protective measures and movement of heavy vehicles are largely blamed for the situation. The physicians observed that constant contact with dust will surely cause different health hazards for people, mainly for the children and elderly ones. Mentionable, improvement works of the two important roads—Port Connecting Road and the Agrabad Access Road started at the end of 2017. The works are being carried out under Batch-2 of the ‘City Governance Project (CGP)’ by Chattogram City Corporation (CCC). The project involving around Tk 160 core will be carried out to repair, widen and modernise the roads which got damaged badly in the severe waterlogging in 2017. Under the project, the CCC will strengthen the significant bituminous roads to save them from the damage frequently caused by waterlogging there. With setting up of lampposts and tiles on footpaths the roads will also get facelift under the project. At present, the width of the roads is around 120 feet (ft) having carpeting on 48 ft while the entire 120-ft width will have carpeting after implementation of the project, said the sources. Moreover, thickness of carpeting of these roads will be increased to 24 inches from the existing two inches, they said adding that the drains beside the roads are being developed with RCC. Digging of the roads for the development works has been producing huge flyable dust in the areas turning the situation intolerable. Residents said it is too tough to move through the roads without mask while they have also been falling sick frequently. Rashedul Hasan, a private service-holder and resident of the area, said the situation is too unbearable that nothing can be seen in the day time due to the flying dust. “I also changed school of my children from the area as the pollution will surely harm the minor children much,” he said. Another resident and a private university teacher Kamrun Nahar Urmi said works should be carried out with sufficient protective measures considering possible health hazard of the people. “People will accept the sufferings for development work but the authorities should speed up the works to rid the residents of the menace,” she observed. 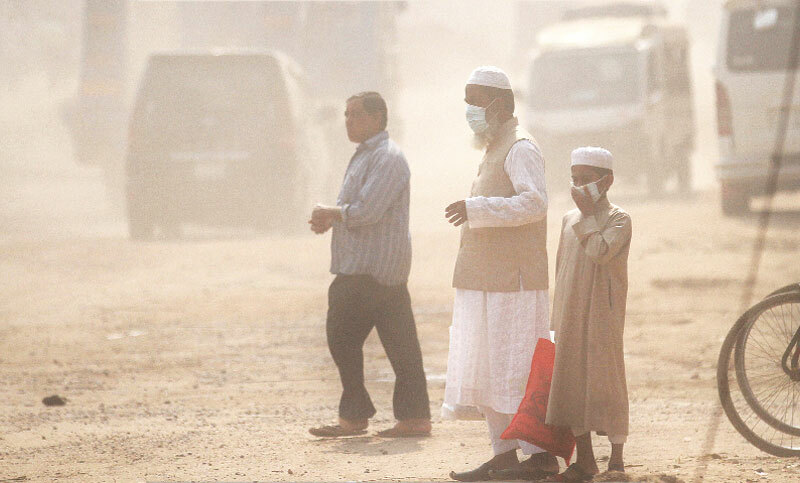 Dr Dhiman Chowdhury, consultant (Pediatrics) of Chattogram Medical College Hospital (CMCH), said the dust has numerous health hazards on both adults and children. “It produces many respiratory problems like coughing, sneezing and respiratory distress to them,” said the physician. These problems eventually may turn into bronchial asthma while the dust also may irritate the eye and skin, he said. “To prevent the hazards, the sufferers can use some preventive measures like face mask, sunglass and long-sleeve dress,” he said adding that the source of dust should be removed as early as possible. Contacted, CCC Chief Engineer Lt Col Mohiuddin Ahmed told the daily sun that some 65 per cent works including construction of drains of the project have already been completed. The works are now going on in full swing to complete carpeting of the roads within the project deadline set for May this year, he said. Asked about the public sufferings for dust in the areas, the chief engineer said they asked the contractors for spraying water in the areas throughout the day. But, frequent movement of heavy vehicles through the busy roads produces huge dust, he said adding that they will pressurise the contractor further for increasing spraying of water to address the problem to some extent.